The older our boys get, the more candy we accumulate this time of year. There are more opportunities to get candy and their tummies are more eager. Last week I peeked inside our "candy bowl" and millions of calories were staring back at me. Curses. I have such a hard time resisting candy. If you are looking for an easy, delicious dessert to bring to a Halloween party, look no further! The look of Halloween with the crazy good sweet and salty flavors of the peanuts and candy corn. If you are looking for an easy, delicious dessert to bring to a Halloween party, look no further! Nothing could be easier than these brownies, except for maybe the cookie version which are just as delicious! In fact, they are so easy to make that I almost feel like a cheater posting about them. Have you ever noticed that eating peanuts and candy corn together tastes exactly like the ooey gooey inside of a Baby Ruth candy bar? 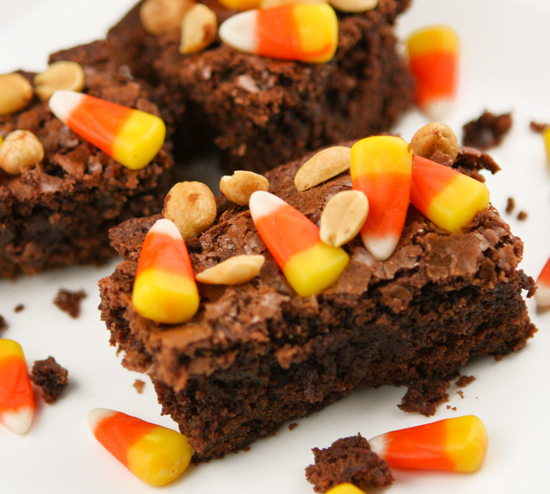 Add some chocolate fudge brownies to the equation and you basically have a Baby Ruth candy bar with a Halloween twist. All you will need to do is prepare a 19.5-oz. package of chocolate fudge brownie mix according to the package directions, using an 8x8 square pan (the thicker the brownie, the better). 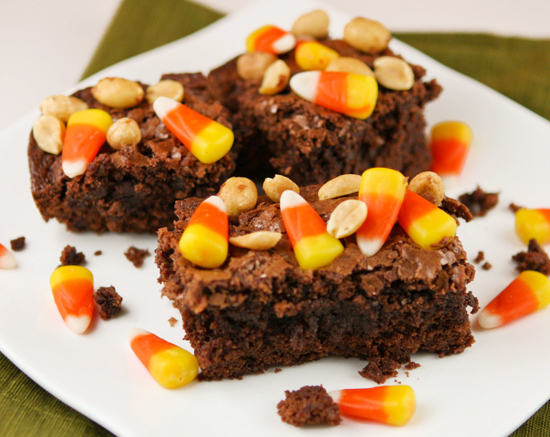 Within a few minutes of removing the brownies from the oven, pour a handful of candy corn and lightly salted peanuts over the top. Gently push the candies and peanuts into the soft, warm, gooey brownies. Allow them to cool and cut into squares! If you are looking for an easy, delicious dessert to bring to a Halloween party, look no further! I have such fond memories of experiencing Halloween as a kid. There is something so special about enjoying holidays as a child. And I find it crazy how the little things that I enjoyed thirty years ago still give me butterflies. Like popcorn balls!